The clink of glasses sounded like wind chimes. It was the most beautiful round hum, almost like a bonbon in the mouth. If you happened to be deaf, the brilliance of the crystal under antique chandeliers sparkled so gorgeously you’d feel a twinge of delight and marvel at the spectacle. It was September 2015 and Halston College was celebrating its first female president in the Mandela suite at the School of International Affairs. The room was designed to host lectures and parties for foreign dignitaries visiting the university. It was a box, a cube in the sky. Floor to ceiling windows faced west. On this night, remnants of lush magenta hues from the setting sun caressed the glass encouraging guests to relax and unwind. Meanwhile, night crept in at the upper edges. Professor Charlene Cox, chatting with some women colleagues, tossed her head, flashing her eyes wide, as she belted out a performative chuckle, “haha,” heard by all those waiting at the bar. She had on her favorite deep purple wrap dress. 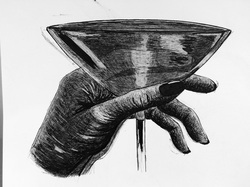 Hand on her hip, cocktail glass held loosely between three fingers. Pinky out. Friskiness tingled up her legs as she returned her head to its customary slant. She had noticed him across the room. Scanned him from head to toe while his back was to her. The Dean of her department, scurrying passed her, had pointed him out after grabbing her shoulder, demanding a turn of her head to the left. “He’s over there, by the bar. In the blue blazer, scarf around his neck. See him? Nicky? Good. I’ll talk to you later.” He said. Her eyes lazily skimmed the burgundy-speckled carpet creating a faux laser beam of vision that landed on Nicky's right calf. Unlike most of the others, he held a Perrier in his hand. He gripped it lightly, tapping his fingers periodically as he nodded his head in agreement with the gentlemen around him. Occasionally, he looked at them in friendly disbelief, eyes aglow, but smiling. His free hand rested easily in his left pant pocket, as if he was killing time. Professor Cox knew it was just a matter of minutes before he’d be standing in front of her. Earlier that afternoon he had called her office and left a message. “Hello, Professor Cox this is Nicky Paul. Dean Charlie referred me. He said that he had spoken to you about my interest in advisors from the Art Department....” She had lingered on the word advisors. Sitting on top of her heavy walnut desk, legs crossed, she had pressed the #4 on her phone to repeat the message several times. His voice sounded direct and respectfully determined. As moonlight started to invade the room the hum of cocktail chatter increased in vitality. Inflections of hostility in shrill altos tempered monotone rationality. Unnamed voices bantered. Across the room, under the perfectly dimmed lighting, Nicky was yawning, politely. His mother had told him to always discreetly cover his mouth and turn to the side if he couldn’t control himself. Absentmindedly, he followed her instructions. The growing crowd, its increasingly colorful nature – students, professors, artists, writers, wives – and his yawn signaled it was time to make his move. “Excuse me gentlemen, it’s been a pleasure talking with you. I’m going to make some rounds and then head out. Long day tomorrow.” He said. His conversational companions nodded and grunted, “Yes of course.” “Need anything, just call...” “Welcome to Halston. Enjoy the ride. Ha ha...” Chuckle, chuckle. Now that the plush white sectional couches had filled up with appropriately intimate intellectual conversations, and the dark corners of the room shaded groups of revelers that appeared to be making late night plans, Nicky could make an approach. Under the cover of others’ distractions a purposeful conversation between two of the handful of ethnically ambiguous partygoers in the room was more likely to go unnoticed. In his experience, it had always worked to keep his strategic alliances under the radar.